Banting House NHSC Wins the Architectural Conservancy of Ontario and Heritage London Foundation’s Built Heritage Award! Last night Banting House NHSC received the Architectural Conservancy of Ontario (London Region) and the Heritage London Foundation’s Built Heritage Award for 2015. It was presented for the major restoration work that has been completed over the last couple of years. The project included restoring the front porch and replacing the original slate roof in order to return the building’s appearance to what it looked like in the 1920s, which is one of the goals for Banting House under its Commemorative Integrity Statement. This award is a great way to cap off a project that took a lot of time and effort to complete, and also shows the ongoing support Banting House is lucky to have from the London community. London has put a lot of effort into preserving its built heritage, from designating buildings to the Architectural Conservancy of Ontario’s (ACO) annual Geranium Tour that lets people discover the interiors of some of the city’s historic houses and buildings. The fact that Banting House has been recognized for its work is great not only because it helps to preserve the heritage of the city, but also helps to return the building to its historic appearance. Being situated in a community that understands the value of the restoration work Banting House undertook makes it that much more rewarding to see completed. Putting the finishing touches on the porch during the restoration project. While I wasn’t at Banting House during the restoration process, I’ve heard so much about the time and energy that went into making it a success, along with those who made it possible. Projects like this can’t be done without the help and support of the community and the people directly involved with it. The restoration would not have been possible without the Community Infrastructure Improvement Fund – Canada’s Action Plan (Susan Truppe MP, London North Centre), a+LiNK architecture inc. (Timothy Finch), and Robertson Restoration (Jamie Robertson & Gino Maniacco). From planning, to construction and scaffolding, to the finished product, the restoration project is something that will be remembered at Banting House for years to come. 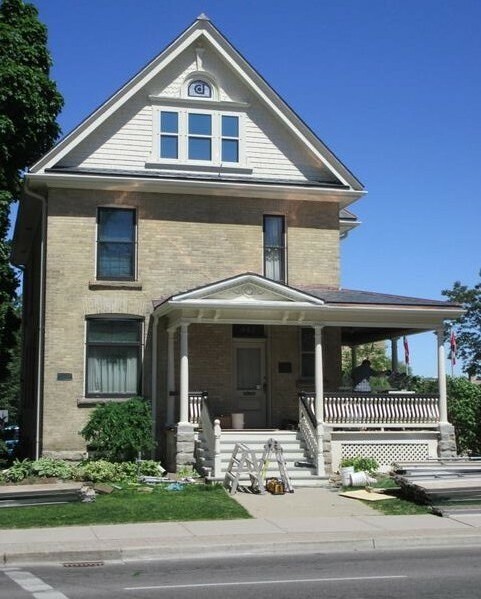 Receiving the Built Heritage Award is a great honour for Banting House as well as the Canadian Diabetes Association. The support for the restoration project gives Banting House that much more motivation to continue its efforts at engaging visitors in an authentic experience. The exterior of the house now matches the efforts that have been made to restore the three rooms inside the building that were associated with Sir Frederick Banting. It is another piece that brings us closer to Banting’s time in the house and what that meant with respect to the discovery of insulin. It has also led into the landscaping project I talked about a couple of weeks ago, which is in some ways the next step at bringing Banting House back to its 1920s appearance. Restoring the porch and roof was an enormous project for Banting House, and it’s great that the ACO and Heritage London Foundation, along with the London community, have recognized and celebrated that fact. For more information about the award, check out Banting House on Facebook! Posted in Uncategorized.Tagged Banting House, Canadian Diabetes Association, Insulin, London ON, restoration.